cook bacon in a cast iron pan. 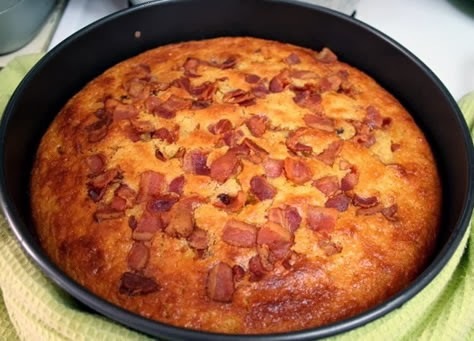 Remove bacon, leaving bacon grease in the pan.whisk dry ingredients together.whisk eggs in a bowl.In another bowl, melt butter then half clumble up bacon add to the eggs. cheese. Pour into the cast iron pan (with bacon grease in it) and shake to settle.Top with the remaining bacon and bake for 35 mins. Let cool in the cast iron pan then remove once cool and slice into wedges.